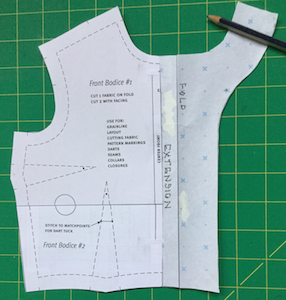 The first post about pattern making for front openings was about adding zips or bands down the opening edge, with a separate finish for the neckline. This is about finishing both front opening and neckline with a facing. 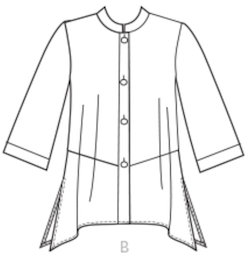 Again starting from a basic pattern, perhaps your TNT pattern for a pullover style, or your personal bodice block. Doing the pattern work is still easy. But not quite so easy ! Neckline facing patterns have curves, so it helps to draw them on paper first. I give 3 examples, each a little more complex. 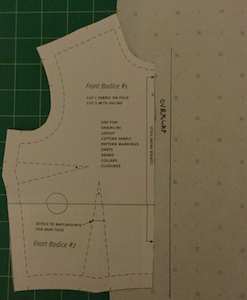 General guide to adding a facing to an unlined garment. Then a separate post with ideas for how you can add to a pattern with faced opening. 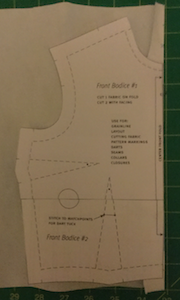 – starter pattern pieces for front and back, with marked centre front CF and centre back CB. – french curve – I have one with width measures round the curved edge, makes it easy to add seam allowances, here’s an example. – pattern paper you can see through. – transparent tape for joining paper pieces. Sorry my photos have got rather blurry at reduced size, but you only need to see the general idea. attach pattern paper to CF of basic starter pattern which you want to adapt. 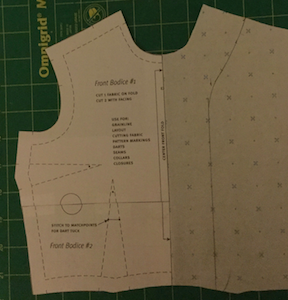 cut out along neckline, shoulder seam, lower edge, then unfold. mark inner edge of facing. set the facing width by eye or by measure, usually 2-3″ / 5-7 cm. Add an overlap strip to the centre front. Usually the width added to CF for the overlap is width of button. This overlap/extension may be called a ‘buttonstand’. 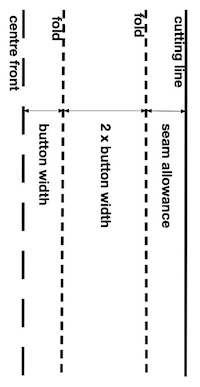 So choose the size of your buttons before doing your pattern making ! 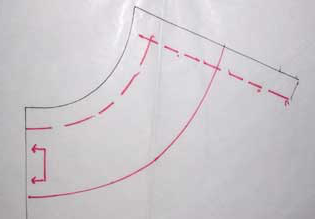 Overlap with cut-on facing – often used on blouses. add overlap extension width and draw fold line. fold paper back on this line. 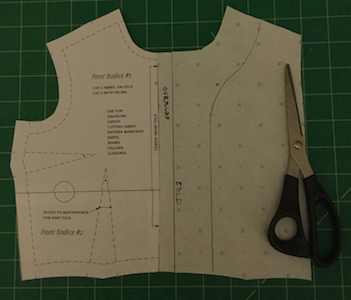 cut out along edge of neckline, shoulder, lower edge, then unfold. mark inner edge of facing, at least 2x button width, usually 2-3″. 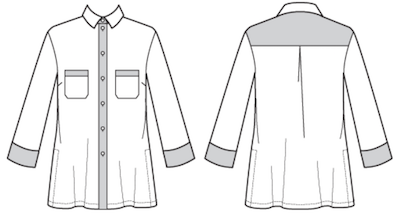 Blouses / shirts / dresses usually have vertical buttonholes, with horizontal ones at stress points such as a shirt neck. Jackets / coats usually have horizontal buttonholes, so you need to allow a wider facing to have space for them. 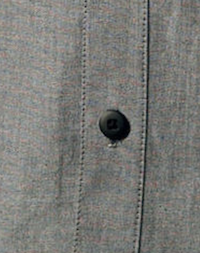 Overlap with separate facing – often used on jackets and coats. A seam along the front edge gives a firmer result with more support, better able to stand up to wear. Extension for double breasted/wrap styles can go out to about bust point or 4″/10cm beyond CF. mark and cut on cutting line. This is the front pattern. You can trace off a facing pattern from this, or make it by cutting as before. Pin to pattern paper and cut around. 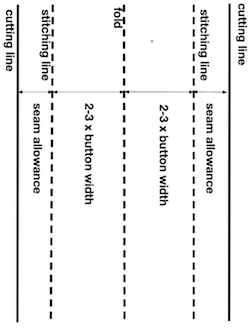 – remember to include width of seam allowance down the front. 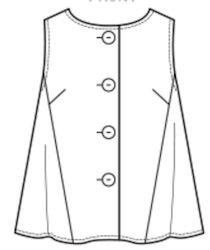 – facings for jackets and coats are often wider – out to bust shaping, so the garment looks good when worn open. If you prefer professional quality instruction 😀 here’s a video from the University of Derby. She’s using a half-size practice pattern block without seam allowances. Use the same method to make a back neck facing pattern. Either trace the top of the back pattern. Or pin the pattern to paper and cut out round the edge. 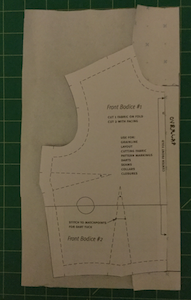 Make the facing with a CB fold, even if the main garment back has a CB seam. 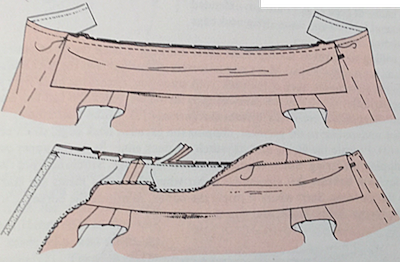 Match length of back facing shoulder seam to length of front facing shoulder seam. Then mark the facing edge, and cut out. If you prefer a video, here’s one from Aneka Truman of Made to Sew. Those facings are the same width all round. Perhaps add interest by making your back facing deeper at CB. Here’s a how-to video from Louise Cutting. 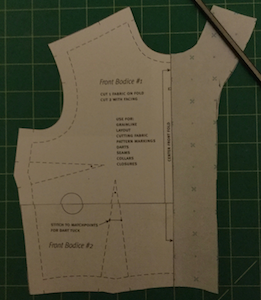 And of course, making a facing pattern for a front neckline without a front opening is just as easy. Or a front neckline facing for a pattern with a front band or zip. Or a facing to finish a sleeveless armhole. 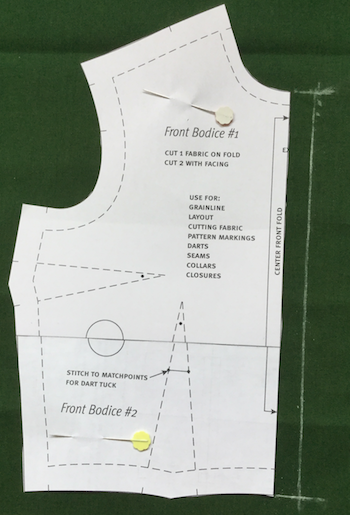 These are general points which usually apply to sewing a facing to an unlined garment. Just a list of what to do, not how to do it. Sew, press, finish shoulder seams. 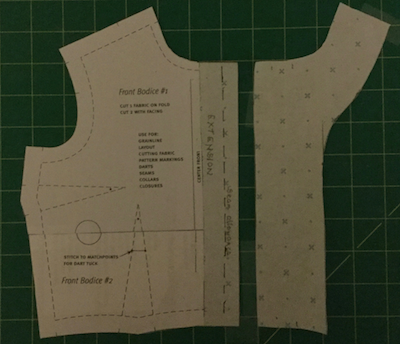 If possible do neckline-front opening work on main body unit before sewing side and sleeve seams – so the body unit can lay flat and is much easier to work on. – interface facing pieces (optional). 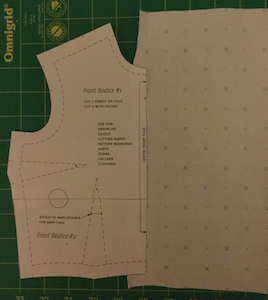 – join front and back facings at shoulder seams. – baste/pin facing in place, right sides together. 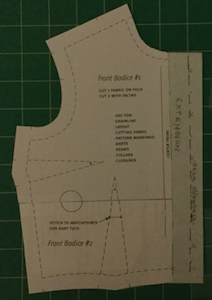 – stitch main body and facing along front opening and neckline edge. – clip or notch so seam allowances lay flat (good advice in this photo tutorial from Sew 4Home on clipping and notching curves). – grade/layer seam allowances (trim them to different widths so they don’t make a lump by all ending at the same point – trim main fabric s/a to about 2/3 width, facing s/a to about 1/3 width). 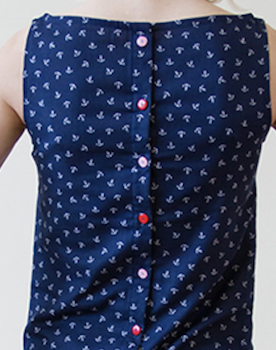 – under stitch (tutorial from Colette patterns). There’s a wealth of facings information in this pdf from the University of Kentucky, though it’s not very visual. 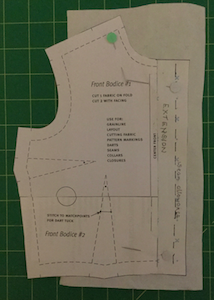 If you prefer video instruction, here’s one on sewing facings from Sure Fit Designs. Sarah Veblen has a photo tutorials class at Pattern Review on facings (not free). Note different experts use different techniques. That can be disconcerting at first, but try them all and see which suits you best. Then there are many ways you can vary it slightly. Some ideas in the next post.